All of the above solution will change the industry as we know it today just like Matterport did to companies like Faro. This is commonly referred to as disruptive technology, not because it has a negative impact on technology, it’s actually just the opposite it brings a positive impact on technology. In the case of the iRIS VR this camera will cost $500 that almost a 10th of what the Matterport camera cost today. As for the Ricoh Theta S and the Samsung Gear 360 these both come in at under $400. The same was true when Matterport introduced their camera, a Faro cost $40k to $50k, granted the Faro can do many thing the Matterport can’t but at a 10th of the cost we could all live with its short comings. I’ve been in this business for a long time and can remember when a GE Lightvalve, the first real commercial video projector cost $250k and video standards converter about the same. What I’m leading up to is we, that is all of us who have embraced the Matterport technology who wanted to be on the cutting edge of tech need to stay ahead of this curve. That means adding new tech to our portfolio of solutions. Offering combined solutions just as some of your do now with aerial footage. This is where cameras like the iRIS VR and Theta S and Gear 360 coming to play by combining this technology you will stay ahead of the competition. I’m asked all the time what does the future hold, should I buy a MP camera. I tell people that at the present time MP owns this space and there is nothing today currently like it. Then I’m asked what will the future hold, well the real future for MP is doing low end virtual tour (VT) conversions for the next generation of phones and tablets which will incorporate Intel’s Realsense cameras. Within the next year these devices will be rolling out and MP will be flooded doing massive amounts of VT’s of little Jimmies birthday party to that trip to the Great Wall and we’ll all be viewing these on MP’s showcase which will explode in viewership and via VR. That’s where the future is for MP and that is why they received so much VC investment. The future for use the professional service providers is providing a fully immersive experience for our clients incorporating the latest in technology to include VR and whatever comes next. Those that don’t, the fence sitters will be left behind as the next generation in tech passes them by. I feel we'll all be safe for the first generation iRIS VR as it look more intended for general use. But and that is a big but depending on the version of the Realsense camera that is used for the iRIS VR that will be the deciding factor as we all know MP is using tech that is at least 2 years old so well have to wait. I think we have another 2 years of opportunity as rolling out the technology and selling enough cameras to saturate the market will take a while. Build customer base and update accordingly and will see what happens. Its the nature of the beast ..
Great post Gary, and I absolutely agree, staying ahead of technology is the only way. 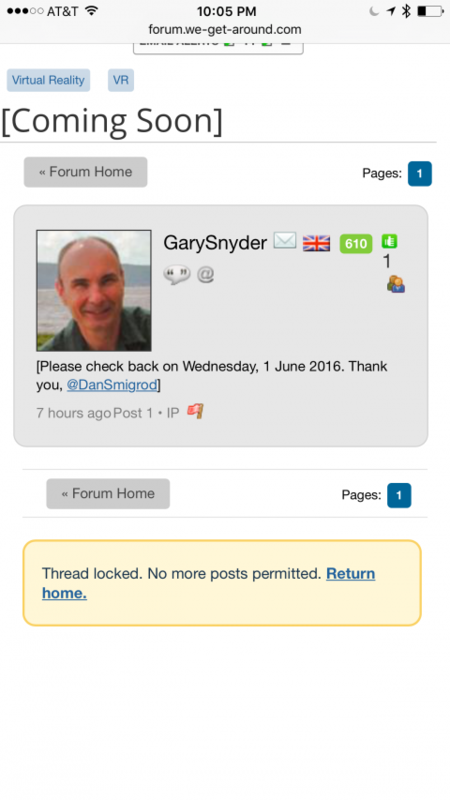 Gary, great post! Extremely informative. New technology moves us ahead and it's exciting. The goal is keep leaning forward without being caught on the "bleeding edge." you're right @3Dwalkmethru , like Gary Said, the Faro system was $40K before MP came out, different systems, different uses, but still a huge difference in price. It's the price we have to pay to stay ahead, what's the alternative, sit on the sidelines? Also, very good points made about the window of opportunity to use current dominating technology to build a client base. That certainly makes up for premium costs associated with being an early adopter. Great post Gary, but even if the first generation is not quality we would use, it may put enough pressure on Matterport to bring its price down. This does not help us but I would hope the added pressure would force Matterport to also take some of the ideas we have given a little more serious. Maybe they do take our input serious but I just do not see as much feedback from them. Which leads into the point of, we have all had input to the wish list and have not heard much on it. If anything I hope the pressure of competition will open the two way communication. The comparison to FARO is great, with the added competition I know FARO's prices did not come down, but the quality of the newer units have far exceeded user expectation. They also have great user input and communication back. Sorry got side tracked. Excellent analysis and much appreciated. Where's the big 1 June announcement that was deleted? Thanks Gary for the post and the previous posts from Dan on helping us stay on top of what may be coming. The tech seems to be more focused on the geometry side of things like the obj file we get.. I guess this is how they may allow free movement in the space. If you are able to remove from the tripod and scan under tables and such whilst and adding to the original scan it's going to be pretty amazing. Perhaps more professional, costly versions will come with better results but with more needed know how. All speculation I guess at this point. This could be what we all asked for. No hosting (we can keep file and send it on) and access to modify and develop the files that can help define your service with your skill. Great input. It might be worth noting here that most of Faro's (and other companies') technology pertains to laser scanning, versus photogrammetry (which MP is using). Both technologies have benefits and deficits of course. And while laser scanning was developed in large part to overcome the accuracy issues with photogrammetry, it certainly seems that photogrammetry's continuing evolution is making it increasingly useful. And as y'all said above, the cost differences for hardware and software make it far more attractive from the price point and ease-of-use perspectives. And those reasons are largely why we're all talking about MP, right? But where both of these technologies fall short (for me and my intended audience at least) is in the area of "intelligence". What I mean, for example, is that while we can manually browse around in a model, we cannot (yet?) search for something by name and then be taken to its location. And that's even if I tag the content, using Matterports in the case of MP. In another thread on this site Mattertags were noted as being game-changing. I tend to agree - especially for the real estate purposes for which MP is so applicable. If the folks at Matterport would add the abilities to create linked Mattertags programmatically, and then to search for them... I assure you those improvements would open entirely new market opportunities for this great technology.